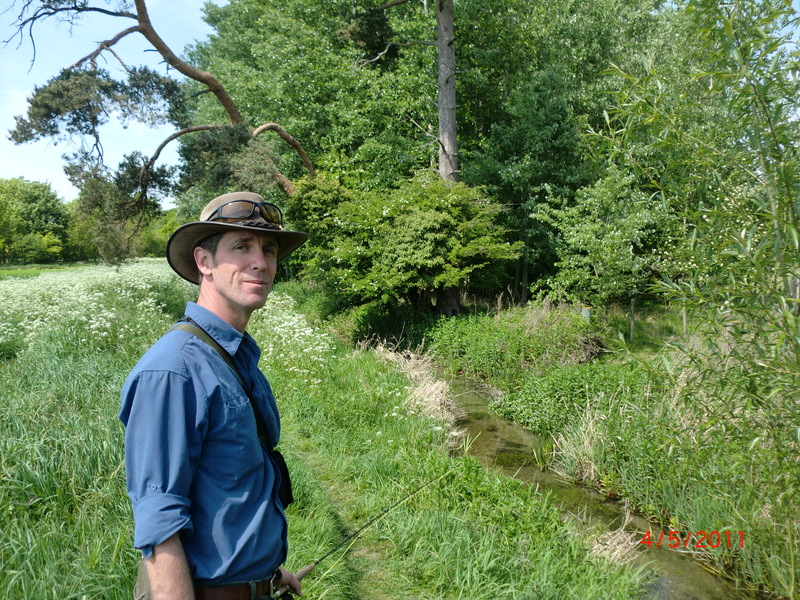 “there’s more of them (trout) than people think (in Cambs)”, Rob wrote. My day with Rob was exciting, instructive, rewarding, relaxed, warm, and so much more. He is a cracking chap. Brought up in this county, he returned after graduating, and is now an Ecology Officer with South Cambridgeshire District Council, and has therefore managed to combine his career and his passion, and for that he is grateful to his Grandad who introduced him to the gentle art when a fourteen year old. He is a ‘giver’……a rarity today. And he told me of secret places, and so they must remain! and a habitat for the population of wild fish to flourish. 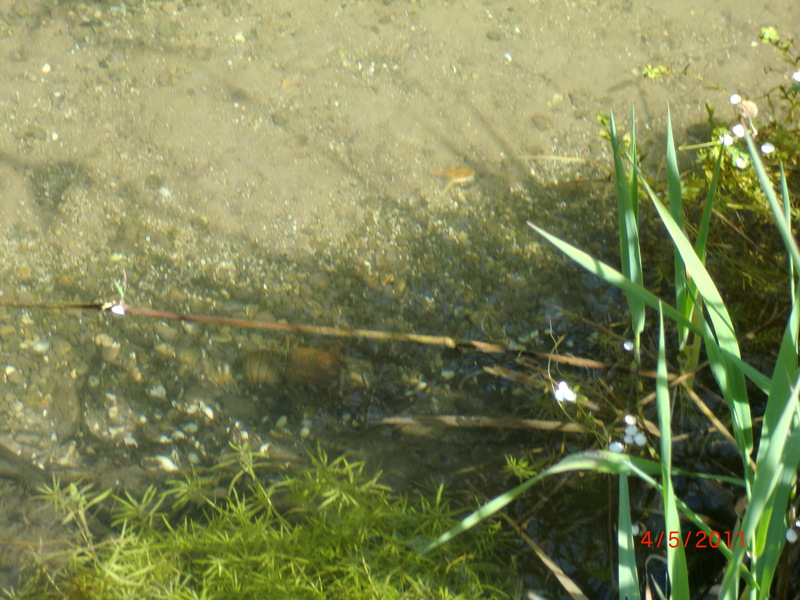 And we saw several fish, but they were so alert that our bush craft approach was insufficient to stop them skidaddling, even when we were downstream and fifteen meters away, they saw us. 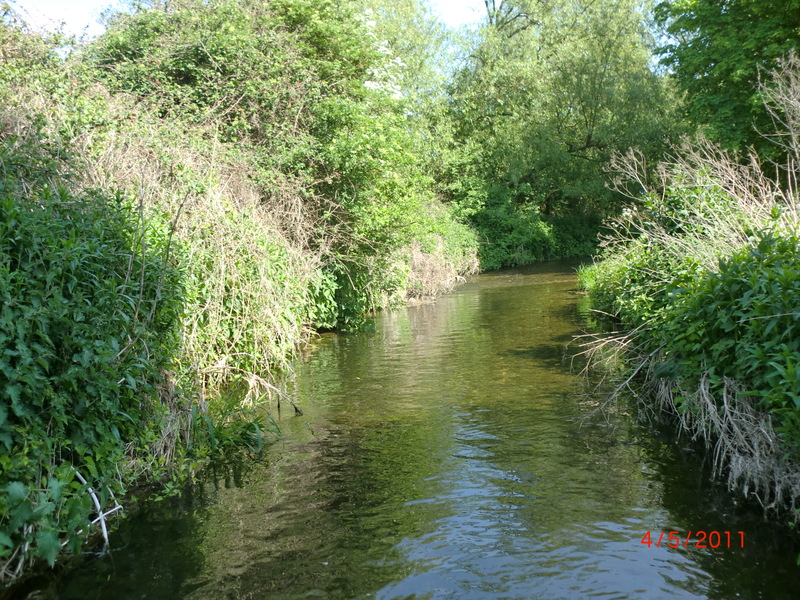 This was/is so special….the Friends of the River Shep should feel truly proud of what they are achieving, in the name of restoration, and their clearance program has produced much weed growth and we identified water crowfoot, starwort, burweed, fool’s water cress, water cress, mint, and lesser water parsnip…and there is probably more! 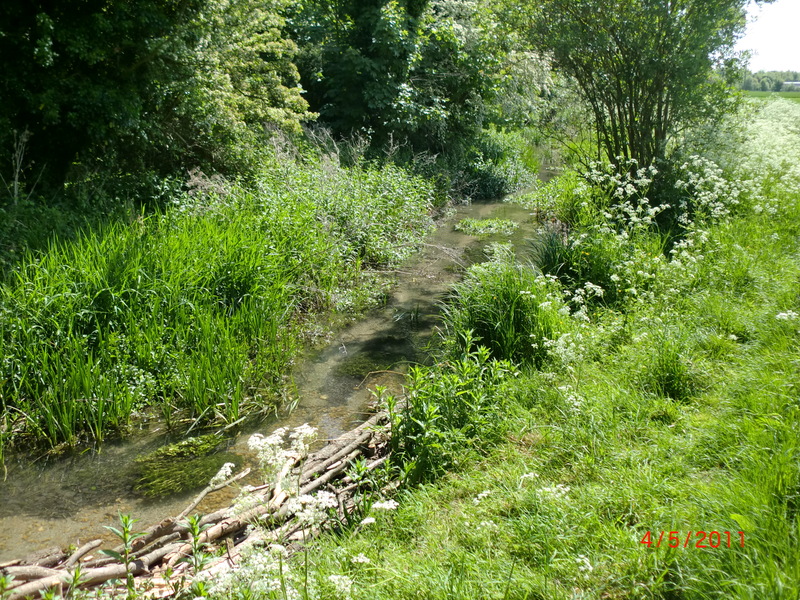 This river may never be a fishery…but it is testament to all Rob believes in making these ancient streams become again, an essential part of the rural scene for the enjoyment and appreciation by all, of our glorious countryside. The disturbing fact about this river, which rises near Linton in Essex, is that flowing through arable land, in this year of an April of the highest temperatures ever recorded, it is being overly abstracted (raped) of its flows. The potato fields are being sprayed by the eccentric arcs of plumes of river water for hours on end which means that river levels are now unusually low and fish stock is vulnerable to cormorants et al. 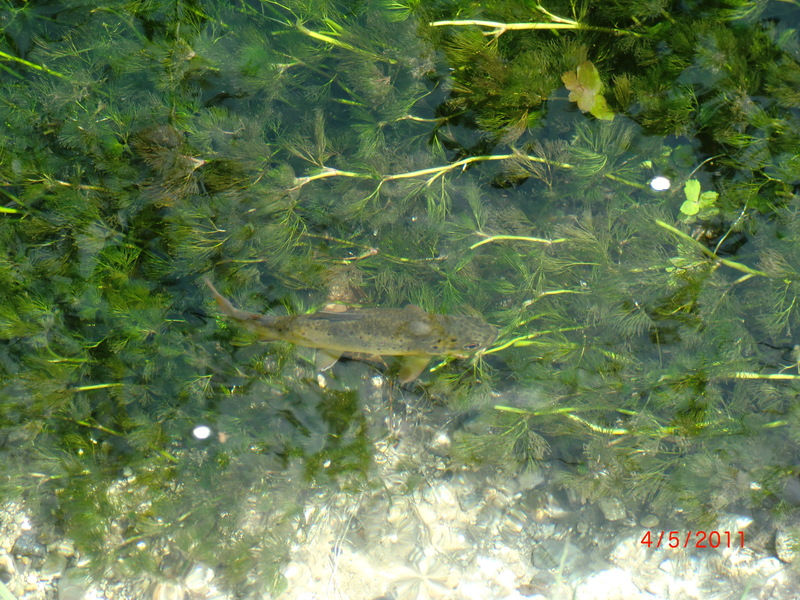 Weed has not grown to give trout the cover and security they need, and aquatic fly form is insufficient in volume to provide them with the food they need, although I did see my first Mays of the year which are at least two weeks earlier than is normal. We watched two good sized trout which were agitated and not by our presence, and it was the arrival of a large pike which reminded us that these trout have more to worry about than aerial predation. 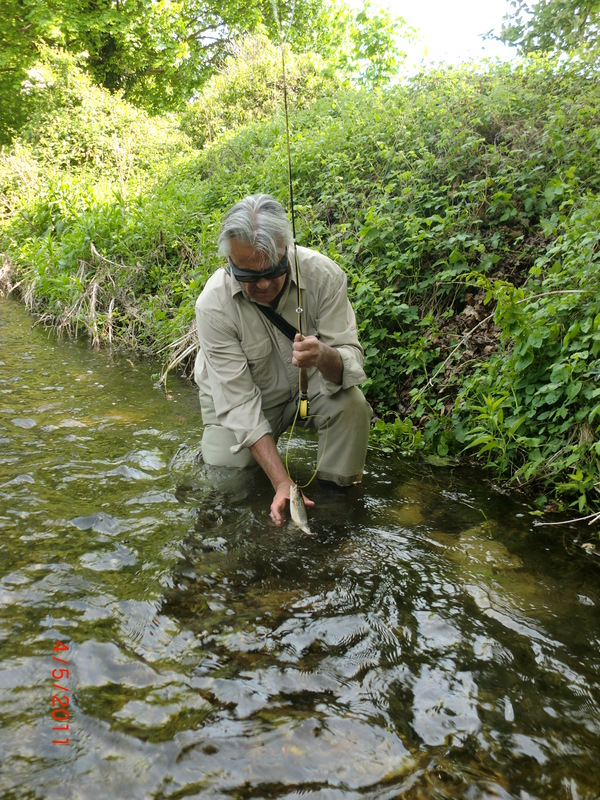 but when we spotted some movement, and nymphing using a copper headed bug, tied by Rob, produced my Cantab trout. And shortly afterward, and at about 3 pm., when a hatch got them coming up, another of Rob’s creations, a mosquito yellow klinkhamer, produced another. Thanks, Rob, for an inspiring day….and I hope your trip to New York the next day, was as exciting an experience, as you hoped.